Situated in the new luxury boutique hotel The Pottinger, known for its modern take on the old Hong Kong charm, Holytan Grill dishes out beautiful works of art, just like its legendary sister branch in Japan. 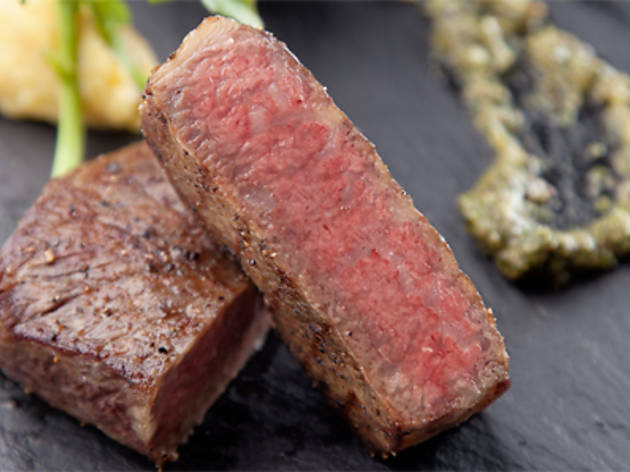 The restaurant prides itself in serving premium Japanese wagyu beef prepared using the French sous-vide technique – it’s worth noting that the chef de cuisine of Holytan Grill Japan, Chef Goto Matsuo, actually co-invented the far infrared oven in 1989 to achieve this technique. We start with the special appetiser ($238) – two small halves of a sea urchin containing a delicious mousse, stunningly layered on a salt bed. Small as it may be, the three-layered smooth mousse packs a flavoursome punch with savoury-sweet umami. We continue with the picturesque slow-cooked blue lobster with tomato sake sorbet ($560). While the savoury sweet sorbet has a peculiar aftertaste of fermenting rice, the blue lobster is perfectly cooked – soft and smooth yet firm in its bite. However, the dish lacks that certain salty crustacean flavour that leaves us wondering if it’s the fault of the chef or a-less-than-stellar source. 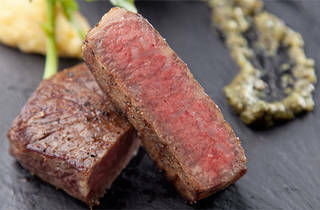 Holytan Grill has two regular beef varieties – the Kagoshima ($480/100g) and Kobe ($680/100g). We are in luck on our visit as a special seasonal Miyazaki ($580/100g) is on offer, which we pick along with the Kagoshima for comparison. We slice through the two ribeyes and they’re as soft as butter. The high fat marbling combined with the far infrared oven sous-vide technique creates the perfect melt-in-your-mouth steak that is juicy and full of flavour. The Kagoshima has a more robust beefy palate than the Miyazaki, which is sweeter. Each steak comes with velvety sweet potato mash, freshly grated wasabi in place of mustard and a secret recipe soy sauce with a hint of yuzu that we can’t stop raving about. Holytan Grill 2/F, The Pottinger, 74 Queen’s Rd C, Central, 2351 5808; pottinger.com. Dinner for two: $2,760.